A few steps forward and you are in the air. 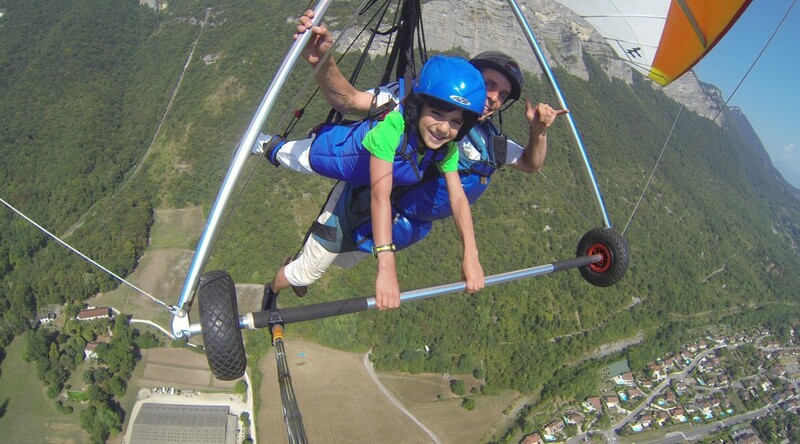 Explore the St Hilaire’ s clifs as a birds do, and enjoy a calm flight of 8-15 minutes. Take your first flying lesson during a 15-30 min flight. you will experience thermal flying, an initiation to aerobatic, and maybe even have the oportunity to lead the glider!! Make a tour of at least 30 minutes above the village of St Hilaire and appreciate the view from above. Aerobatic and piloting can also be part of the flight for you, and you will leave with the full set of photos/video from your flight. Discovery day is for you if you want to have a first learning experience. In the morning you will do, with the other students, some test runs on small sloops alone under the glider. It will allow you to be initiated to the handling of the wing and to the basics of piloting. And then in the afternoon, you will make a tandem flight and taste the real thing with one of our professional pilots next to you. If you would like to keep a souvenir, we can take HD pictures and video of your flight an hand it to you on an SD card. Calendar for the 2019 season is now online. Details are on our calendar page. Thanks to all the British, Irish, Belgian, Iranian and Dutch pilots that came to our school last year, the season was great. You can find pictures HERE. For 2019 the planning and pricing will be on line end of January. But anyway if you are interested do not hesitate to contact us via e-mail at contact-at-ledeltateam.com. Planing for 2018 is on-line. It is detailed on our calendar page. We hope to see you on our beautiful site.